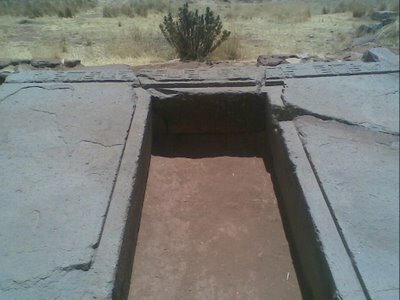 Puma Punku: (Puma Puncu, Puma Pumku). Puma Punku is a single part of the greater Tiahuanaco complex. The Puma Punku temple offers one of the best examples of masonry skills in the whole of the pre-Columbian Americas. Other incredibly carved temple complexes such as the Peruvian Inca walls of Sacsayhuaman, or the Inca masonry at Machu Pichu and Ollantaytambo pale to insignificance when compared with the sheer skill, accuracy and perfection achieved at Puma Punku. According to Anthropology Professor W. H. Isbell, a radiocarbon date obtained from mound fill forming the Puma punku deposited during the oldest of three construction epochs dates the earliest construction epoch of the Puma punku at 1510 ±25 B.P. (A.D. 440; calibrated, A.D. 536–600). (6) This would place the building of the temple at the beginning of the third great Tiwanakan cultural expansion. 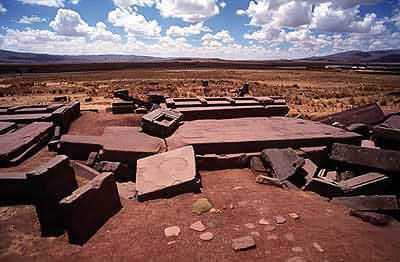 The Puma punku was an terraced earthen mound originally faced with megalithic blocks. It is 167.36 m wide along its north-south axis and 116.7 m long along its east-west axis. On the northeast and southeast corners of the Puma punku it has 20-meter wide projections that extend 27.6 meters north and south from the rectangular mound. 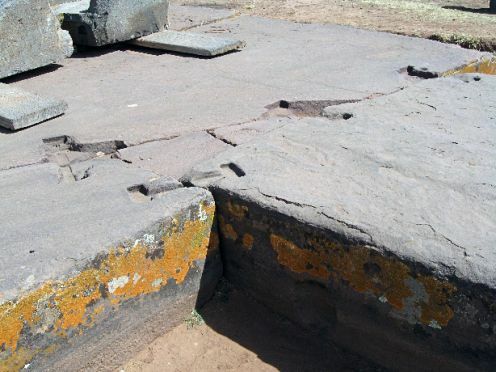 The eastern edge of the Puma punku is occupied by what is called the “Plataforma Lítica.” The Plataforma Lítica consists of a stone terrace that is 6.75 by 38.72 meters in dimension. This terrace is paved with multiple enormous stone blocks. 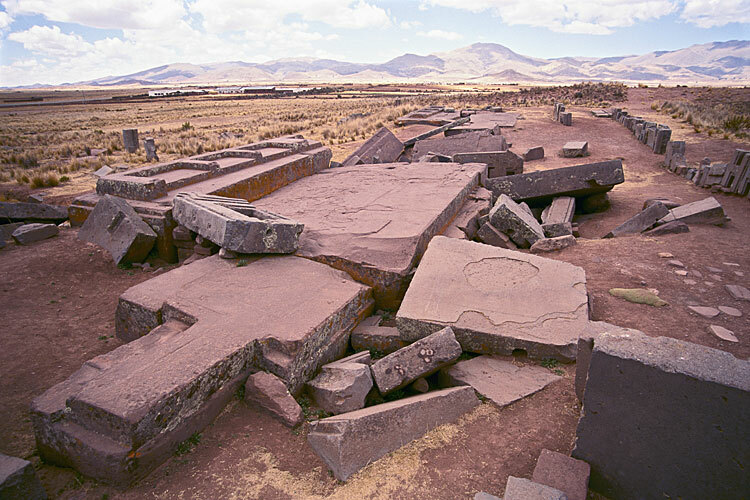 The Plataforma Lítica contains the largest stone slab found in both the Pumapunku and Tiwanaku Site. 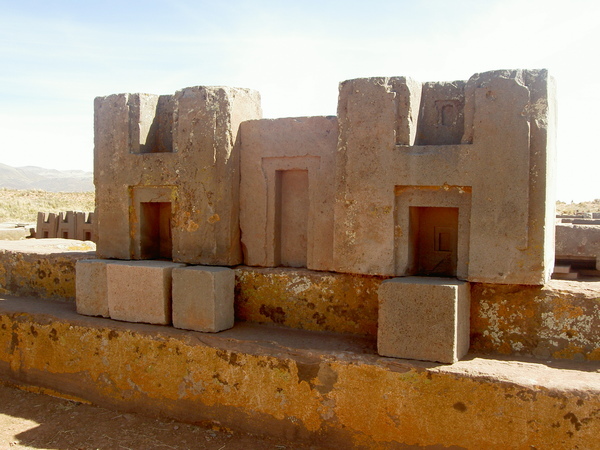 Puma Punku was an emblem of the sacred mountain. A complex system of channels conducted rainwater from a sunken court on the summit into the interior of the pyramid, threading it from one terrace to the next. The water ultimately cascaded out from tunnels driven horizontally into the structure’s foundations. 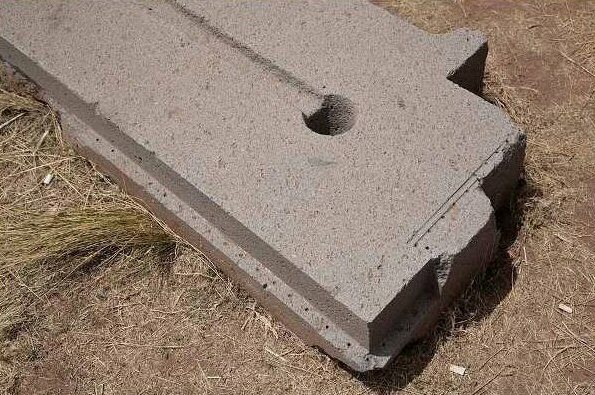 The side walls of the water channels in the Akapana and at Puma Punku are built with upright stone slabs held together with I-shaped clamps. Protzen thinks this was to hold the slabs in the proper alignment. 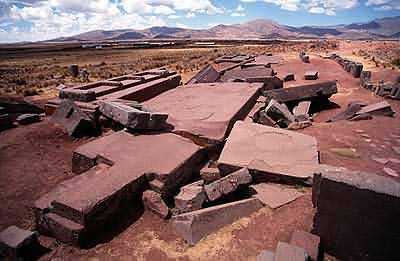 Clamps also once pieced together the enormous sandstone slabs used in the construction of the four platforms at Puma Punku. 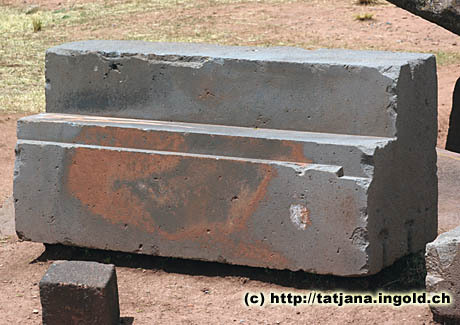 A unique feature at Puma Punku is the use of recessed clamping. 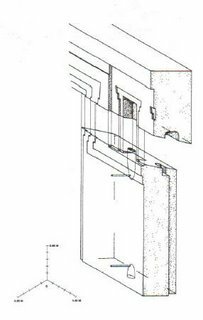 The clamps used had a wide range of shapes and sizes, and the fact that the clamps are level even when the channel walls and the clamp sockets are at a slope of about 12° is usually interpreted to mean that they were cast directly into the sockets. A spectrographic analysis of a surviving clamp showed that it was made of an unusual alloy – 95.15% copper, 2.05% arsenic, 1.70% nickel, 0.84% silicon and 0.26% iron. Other examples of 'Brick Ties' can be seen in the floor at Puma-punka. It is now believed that theses 'Ties' were made by pouring molten metal into the prepared holes. A portable smelter operating at extremely high temperatures would have been required for this purpose. The Inca themselves denied building the Tiahuanacan complex. We now know that the Tiwanakan culture existed independently of the Inca, and from slightly before. A fact that is stored into their traditions and myths. The Inca origin myth records neary Lake Titicaca as the origin point of humanity. They record that Viracocha began his journey from this place, until following much wandering, Cuzco became chosen as the birthplace of the Inca nation. 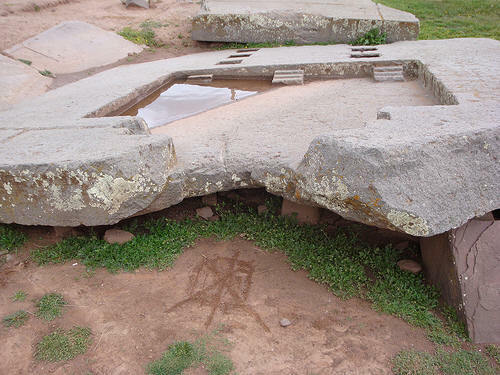 NEWS: Indiegogo.com (Dec, 2013) Cosmogenic Dating of Megaliths at Puma Punku to take place. 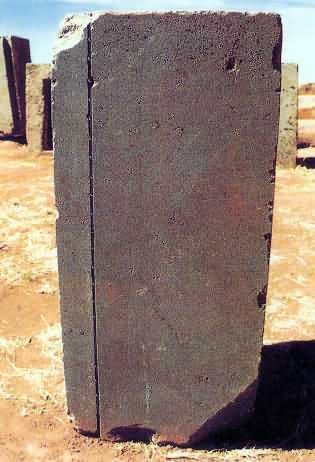 'Andesite megaliths in Puma Punku, will be evaluated by beryllium-10 cosmogenic dating to determine the prehistory date when the stone was quarried and machined'. 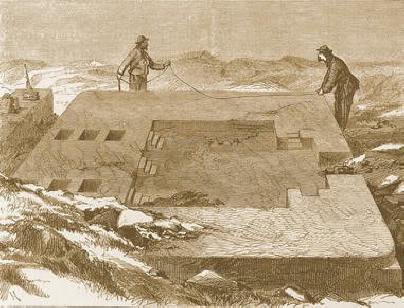 Even though the site is two miles above sea level, the Tiwanakan builders managed to move stones, some weighing over 100 tons, for ten miles to get them into place. There is no evidence of the wheel in Tiwanakan culture, and there are no trees in the area to use as rollers. The feat of moving the stones for ten miles (let alone 90), is an incredible achievement in its own right. A close inspection of the stone above reveals that there are regularly spaced drill marks along the precision-cut 6mm groove. 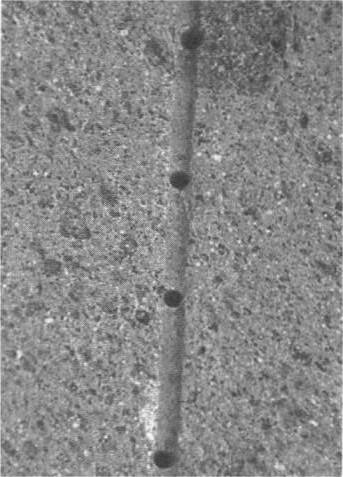 In the photo above, the same small drill holes can be seen in several areas where they appear to have been used as miniature 'pilot-holes', - perhaps in order to assist splitting the stone. The internal angles and faces of this stone were finished to 'machine' quality. One of the most interesting things to have transpired about the site is that many of the immense blocks were built as if from a template, and amazingly appear to interlock as the picture below illustrates. Such a discovery flies directly in the face of all our concepts of the construction skills of the ancients. With no previous examples of masonry at such a sophisticated level, nor on such great scale leaves one to wonder at the confidence and skills of the designers and masons. 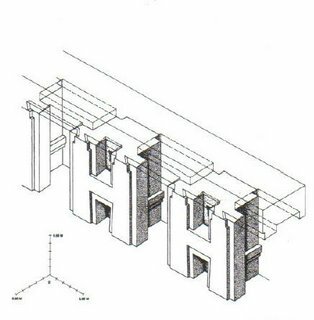 The numerous H-shaped blocks have approximately 80 faces on each. They all match each other with extreme precision suggesting that the architects used a system of preferred measurements and proportions. Fallen Stone Gateway. Similar in style to the 'Gateway of the Sun' at nearby Tiahuanaco. Drawing from 1877 (left), and recent photo (Right), of the same stone - although slightly more broken. The 'After' photo (post-restoration)... (nudge nudge academia)...! 1). David Zink. The Ancient Stones Speak. 1979. Musson Books. 4). Robinson, Eugene. In Bolivia, Great Excavations; Tiwanaku Digs Unearthing New History of the New World, The Washington Post. Dec 11, 1990: d.01. 6). Evans, Susan Toby; Pillsbury, Joanne, Palaces of the Ancient New World: 2004. Dumbarton Oaks Research Library and Collection. 9). W.R. Corliss, Ancient Structures: Remarkable pyramids, forts, towers, stone chambers, cities, complexes, Glen Arm, MD: Sourcebook Project, 2001, pp. 52-60. 11). Lechtman, H.N., 1997, El bronce arsenical y el Horizonte Medio. En Arqueología, antropología e historia en los Andes. in Homenaje a María Rostworowski, edited by R. Varón and J. Flores, pp. 153-186. Instituto de Estudios Peruanos, Lima.